Situated on 6 beautifully landscaped acres in the middle of Branson's many shows and attractions. Presley's and the Hollywood Wax Museum across the street, The Baldknobbers and the Americana Theatre an easy stroll. Malls to your right and left. Featuring a campus like atmosphere, 143 rooms of all types, 4 buildings and a full service restaurant and bar. 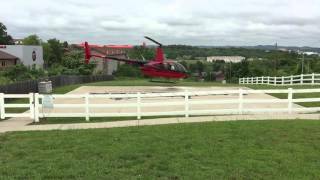 How many other lodges offer helicopter tours and a complete ticket agency for Branson shows and attractions on-site? Eager to please and willing to go that extra mile to make your stay memorable. Give us a try. You will be back. Each room includes a coffee maker, cable TV and high speed Wi-Fi, all with refrigerators and microwaves. Many loyal guests return time after time for our lavish Something for Everyone breakfast. We offer seasonal rates and kids always stay free.